The famous link between the U.S. president and Soviet leaders was launched half a century ago. The famous hot line connecting Washington and Moscow celebrates and important milestone this month. The line, which was launched in 1963, turns 50 this month. It was established in the aftermath of the Cuban Missile Crisis in October 1962, when the need for a direct link between the United States and the Soviet Union became clear. The line was used as an emergency link between the leaders of the two superpowers at the height of the Cold War. There are many myths surrounding the line, beginning with its name. To begin with, it was not direct. The connection was by cable under the Atlantic and then via London, Copenhagen, Stockholm and Helsinki; a backup system ran through Tangier, Morocco. In 1978, international satellite systems began to be used. Additionally, it was not initially a telephone – the heads of state exchanged text messages transmitted by teletype. It was only in the early 1970s under Leonid Brezhnev that a telephone was installed. The line has long been out of use – today the presidents prefer to speak by telephone, but it remains in excellent shape. The Washington Post recently published reminiscences by former White House situation room chiefMichael Bohn, who worked under Presidents Lyndon Johnson, Richard Nixon and Jimmy Carter, and explained how the leaders used the system when tensions arose. Bohn also stated that the system is still tested every hour. The hot line opened with trial letter sent by the Americans in August 1963. It was the phrase “The quick brown fox jumped over the lazy dog,” which contains all the letters in the English alphabet. The line was first actually used in the early days of the 1967 Arab-Israeli war, when about 20 messages were transmitted. 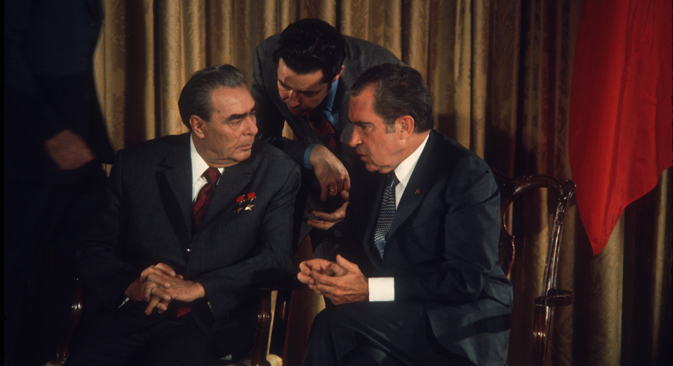 Bohn recalls that U.S. Defense Secretary Robert McNamara woke up President Johnson at 7 am to tell him that a message from Soviet premier Kosygin had been received. The red line was also used in peacetime. For example, President Johnson ordered a message to be sent to the Soviet Union informing it of the American Apollo spaceship missions. A fax line was added to the hot line in 1985. It was used in 1985 to transmit a long, hand-written message from Gorbachev, and the American translators were hard put to make out his handwriting. Gorbachev and Reagan were the last leaders to use the line. In 1991, a direct telephone link was installed. It was used by Boris Yeltsin and George Bush Sr.